A Plague of Giants (Seven Kennings, #1) by Kevin Hearne. Del Rey, 2017. Hardcover. 640 pages. 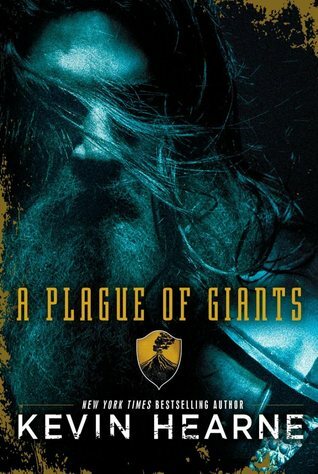 I've been seeing some pretty mixed review for A Plague of Giants so far, but I'm happy to say that I loved this book. The premise is that of a frame story, in which there is an outer story with one main character narrating the present, and the other half of the story is told by a bard who tells his tale through the usage of a variety of different characters. The bard tells parts of his story each day by taking on the form of different characters and having them tell their story through him. I love this idea, largely because I've always been intrigued by bards and the various methods of storytelling, so I thought that this was a fantastic way to tell an epic fantasy tale. I can't say that the story and plot itself is anything overly unheard of, but it's the details and the characters themselves that make this story stand out so much. A Plague of Giants is complex, intricate, and beautifully written. I really loved the world created in this book, even if I don't fully understand it. There is a rich array of cultures and diverse characters, which I found fascinating and also rather refreshing. As is the case in most books with multiple POVs, I found myself a bit uninterested in one or two them (Nel, Meara), which did make it a bit of a drag to get through. However, the rest of the narrators and story bits were deeply compelling and more than made up for the boring ones that were few and far between. I was particularly enraptured by the main character Dervan's story, Abhi's, and Gondel's. The sheer detail of each perspective gave each character such a distinct personality that I really appreciated. I found myself slightly confused about a few things here and there, but for me personally that wasn't a major hindrance because, if we're being honest, it's not uncommon for me to get a bit lost or confused in epic fantasy. There's just too much going on for me to necessarily have a full grasp on everything unless I've read the book multiple times or had a chance to discuss it more at length. I also would have loved to see a map of this world. This is the first book I've by Hearne, so I don't know if his books are normally as witty as this particular book was, but I loved it. I chuckled at many points throughout this book, but that doesn't mean that it didn't have its more depressing or dark moments as well. This book doesn't hold back, but it also isn't unnecessarily violent or gory. It uses violence and intensity at appropriate moments and for appropriate lengths. There's no censoring or attempt to make things nicer--there are certainly some gory moments--but it doesn't overdo it or normalize it too much, which was a nice reprieve from all the grimdark I've been inhaling lately. Overall, I've given A Plague of Giants four-and-a-half stars! If you are a fan of epic fantasy or really wonderfully told stories with many layers, go pick this one up! I loved some of the Iron Druid Chronicles books, so I'm looking forward to reading this one. I have a copy through Netgalley I need to get around to reading. Great review!